Most of us live by the water, so why not our data centres, too? 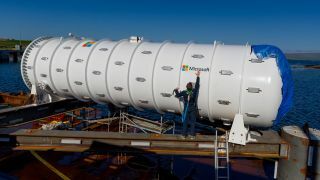 Microsoft is moving forward with its idea of an underwater data centre with the second phase of Project Natick. The launch, taking place off the Orkney coast in Scotland, aims to make the internet experience faster, and AI more accessible. One of the arguments for putting a data centre under water is the fact that half of the world’s population lives 120 miles of the coast, and by putting data centres in bodies of water near coastal cities, data would have a short distance to travel. Phase two of Project Natick will allow Microsoft to see if the concept is logistically, environmentally and economically practical. Phase one was to see if the concept was feasible. The second argument is that it’s colder under water, and that there’s less corrosion. Talking to the BBC, the project’s leader, Ben Cutler, said: "We think we actually get much better cooling underwater than on land. Additionally because there are no people, we can take all the oxygen and most of the water vapour out of the atmosphere which reduces corrosion, which is a significant problem in data centres." Over the next 12 months, the team behind Project Natick will monitor and record the performance of the unit, before hopefully moving further forward with the plan.